"Massachusetts Marriages, 1695-1910," database, FamilySearch (https://familysearch.org/ark:/61903/1:1:FCX6-HSW : accessed 11 February 2016), Thomas Lunt and Opportunity Hoppin, 17 Jun 1679; citing reference ; FHL microfilm 823,653. "Massachusetts Births and Christenings, 1639-1915," database, FamilySearch (https://familysearch.org/ark:/61903/1:1:VQ6L-913 : accessed 11 February 2016), Oportunity Hoppin, 15 Nov 1657; citing ROXBURY,SUFFOLK,MASSACHUSETTS, ; FHL microfilm 0928294 IT 3. "Massachusetts Births and Christenings, 1639-1915," database, FamilySearch (https://familysearch.org/ark:/61903/1:1:FHMW-158 : accessed 11 February 2016), Mary Lane, 14 Jun 1687; citing Boston, Suffolk, Massachusetts, Pg 153-154; FHL microfilm 592,866. Steven Hoppin was born perhaps about 1622. "Massachusetts, Town Clerk, Vital and Town Records, 1626-2001," database with images, FamilySearch (https://familysearch.org/ark:/61903/1:1:F4L2-FWR : 13 July 2016), Thomas Hoppin, 21 Mar 1655; citing Birth, Roxbury, Suffolk, Massachusetts, United States, , town clerk offices, Massachusetts; FHL microfilm 741,320. 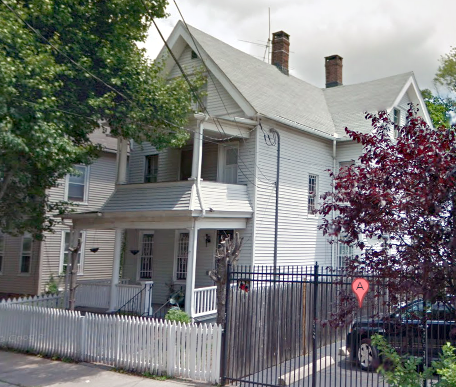 "Connecticut, Births and Christenings, 1649-1906," index, FamilySearch (https://familysearch.org/pal:/MM9.1.1/F7QP-ZBB : accessed 07 Dec 2012), Waldo Gilbert in entry for Gilbert, 09 Jun 1891; citing reference 63, FHL microfilm 1405868. 1900 United States. Census Office. 12th census, 1900 population census schedules, Washington, District of Columbia: Bureau of the Census Micro-Film Laboratory, ([197-]) , Census Place: New Haven, New Haven, Connecticut; Roll: 146; Page: 10A; Enumeration District: 0385; FHL microfilm: 1240146. Donald Lines Jacobus, Families of Ancient New Haven, (1922-32) , p. 794. Bill Hosko was born perhaps about 1983. Alvin Lee Rhods, The Royce Family in America, , at https://books.google.com/books?id=e-5OAAAAMAAJ . Madison, AL: (2005) , p. 121. (?) Houghton was born perhaps about December, 1838. He was the son of Lewis Willard Houghton and Mary Ann Nourse. (?) 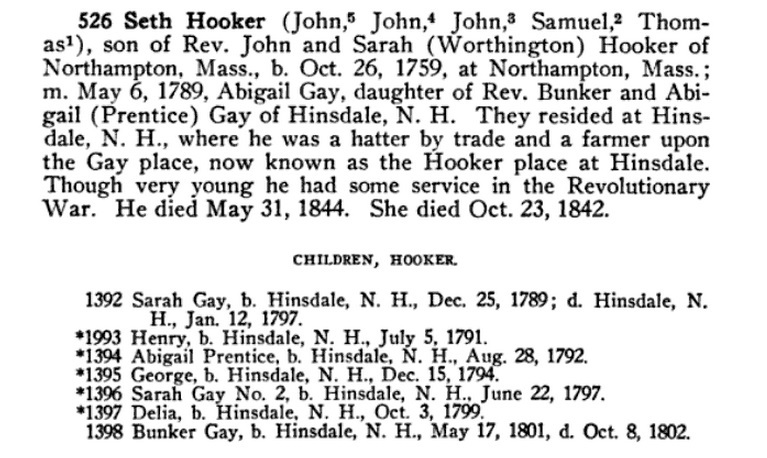 died on December 11, 1838 in Waterford, Oxford County, Maine. Elizabeth Bryant Johnston, Lineage Book - National Society of the Daughters of the American Revolution, Vol. 6, , at https://books.google.com/books?id=0mYZAQAAIAAJ . Washington, D. C.: (1898) , p.300. "Maine Births and Christenings, 1739-1900," database, FamilySearch (https://familysearch.org/ark:/61903/1:1:F4SZ-HJK : 4 December 2014), Abby Maria Houghton, 17 Aug 1839; citing Waterford, Oxford, Maine; FHL microfilm 12,625. 1880 United States. Census Office. 10th census, 1880 federal population census, Washington, District of Columbia: National Archives and Records Service, ([19--]) , FHL Film 1254479; National Archives Film T9-0479; Page 232C. Abel Houghton was born on October 13, 1784 in Harvard, Massachusetts. Abel Houghton was baptized on October 31, 1784 in Harvard, Massachusetts. The History of Waterford, Oxford County, Maine, , at http://books.google.com/books?id=Qwg1AAAAIAAJ . Portland, ME: Hoyt, Fogg, & Donham, (1879) , p. 258-259. "Maine Marriages, 1771-1907," database, FamilySearch (https://familysearch.org/ark:/61903/1:1:F4X7-NWT : 4 December 2014), Abel Houghton and Betsy Green, 15 Feb 1808; citing Civil, Waterford, Oxford, Maine, reference ; FHL microfilm 12,625. Robert Safford Hale, Genealogy of descendants of Thomas Hale of Watton, England, and of Newbury, Mass., , at https://archive.org/stream/genealogyofdesce00hale . Albany, N.Y.: Weed, Parsons and Company, printers, (1889) , p. 338. Find A Grave Memorial# 74150753. "Maine Births and Christenings, 1739-1900," database, FamilySearch (https://familysearch.org/ark:/61903/1:1:F4SZ-V9Z : 4 December 2014), Luther Houghton, 27 Dec 1808; citing Waterford, Oxford, Maine; FHL microfilm 12,625. "Maine Births and Christenings, 1739-1900," database, FamilySearch (https://familysearch.org/ark:/61903/1:1:F4SC-1HF : 4 December 2014), Betsy Green Houghton, 07 Aug 1812; citing Waterford, Oxford, Maine; FHL microfilm 12,625. "Maine Births and Christenings, 1739-1900," database, FamilySearch (https://familysearch.org/ark:/61903/1:1:F4SZ-V9N : 4 December 2014), Levi Howard Houghton, 20 Nov 1813; citing Waterford, Oxford, Maine; FHL microfilm 12,625. "Maine Births and Christenings, 1739-1900," database, FamilySearch (https://familysearch.org/ark:/61903/1:1:F4SC-168 : 4 December 2014), Elizabeth Warren Houghton, 28 Mar 1816; citing Waterford, Oxford, Maine; FHL microfilm 12,625. 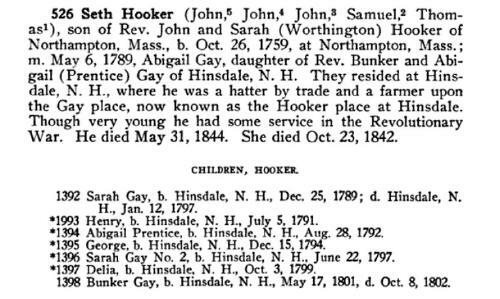 "Maine Births and Christenings, 1739-1900," database, FamilySearch (https://familysearch.org/ark:/61903/1:1:F4SZ-V9K : 4 December 2014), Daniel Green Houghton, 28 Mar 1816; citing Waterford, Oxford, Maine; FHL microfilm 12,625. "Maine Births and Christenings, 1739-1900," database, FamilySearch (https://familysearch.org/ark:/61903/1:1:F4QN-581 : 4 December 2014), Daniel Green Houghton, 23 Nov 1817; citing Waterford, Oxford, Maine; FHL microfilm 12,625. "Maine Births and Christenings, 1739-1900," database, FamilySearch (https://familysearch.org/ark:/61903/1:1:F4SC-16X : 4 December 2014), Elizabeth Warren Houghton, 09 Jun 1819; citing Waterford, Oxford, Maine; FHL microfilm 12,625. Vital Records of Bolton, Massachusetts, to the end of the year 1849, Worchester, MA: Franklin P. Rice, (1910) , p. 41. She was the daughter of Henry Luther Houghton and Harriet Elizabeth Hale. Marshall L. McClanahan, John & Beatrix (Joselyn) Houghton of Lancaster, Massachusetts, Seal Beach, Calif.: (1973) , p. 172A, 185. Amanda Houghton was born on October 23, 1825 in Waterford, Oxford County, Maine. 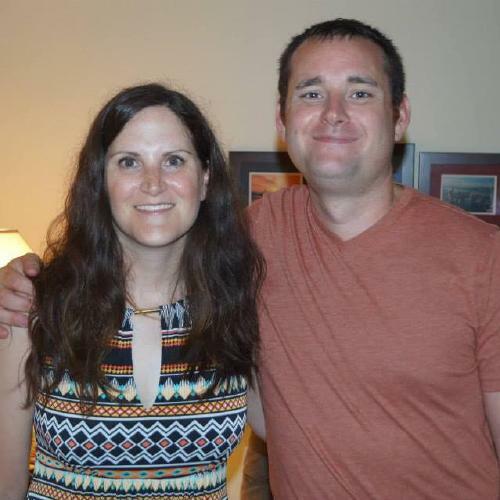 She was the daughter of Deacon Jonathan Houghton and Susan Littlefield. Find A Grave Memorial# 86789964. Everett Schermerhorn Stackpole, History of Winthrop, Maine, , at https://books.google.com/books?id=zwc1AAAAIAAJ . Press of Merrill & Webber Company, (1925) , p. 426. "Maine Births and Christenings, 1739-1900," database, FamilySearch (https://familysearch.org/ark:/61903/1:1:F4HB-XYM : 4 December 2014), Amanda Houghton, 11 Dec 1821; citing WINTHROP,KENNEBEC,MAINE; FHL microfilm 12,299. "Maine, Faylene Hutton Cemetery Collection, ca. 1780-1990," database with images, FamilySearch (https://familysearch.org/ark:/61903/1:1:QKM1-S651 : 16 April 2015), Amanda Houghton, 1839; citing Burial, Winthrop, Kennebec, Maine, United States, Maine State Library, Augusta; FHL microfilm 1,769,795.